Despite K-Pop being a mainstream genre within a somewhat conservative culture, there are some idols who push boundaries with their lyrics, clothes, music videos, looks, etc. So it comes expectant that even in a country that has Confucian dogma you can find some black sheep in the bunch defying other aspects of society that ultimately end up damaging individuals, like gender roles. What are gender roles, you ask? It’s the set of behavioral norms one “must” follow depending on whether you’re male or female. You know, blue and toy trucks for boys, pink and dolls for girls –that type of thing. But the problem with binding gender roles goes far beyond pants and dresses. Trouble arises when society limits people to these set rules and don’t allow or look down on the ones who choose to flourish outside of them. This list is exactly about that; those male idols who choose to push and bend society’s notions on gender and are successful at it. Hongki, the charismatic lead singer of the Korean pop rock band FT Island, embodies what we regularly associate with the word “rockstar.” Onstage and through his TV appearances, Hongki always displays his I-don’t-give-a-damn persona, whether he’s being snarky with his remarks or challenging FNC Entertainment’s CEO publicly. Hongki takes his strong personality everywhere he goes and doesn’t only do it for show. But the thing that’s most “punk rock” about the singer is probably his love for nail art. Hongki wouldn’t be the first rockstar to don nail polish to compliment his style, but he definitely is unique in that he released a book completely dedicated to nail art called Lee Hong Gi Nail Book. The 144-page long book includes the singer’s stories and insight on nail art and is a best seller in Korea, Japan, and China. Over the years, men have pushed through the taboos and social awkwardness of getting manicures and pedicures, and it’s no longer a rarity to see a man at a salon getting these procedures. But to rock full-on designs and flashy colors? That’s not what many heterosexual men would willingly do. Nail polish has always been marketed for women, and with that, branded as a feminine product. The fact that Hongki got past his and other people’s prejudices to the level of rocking and spending $45,000 a year on nail art is commendable. Nail art doesn’t take away anything from Hongki’s personality or look, it merely enhances it. After all, it’s just paint and design on nails. Rappers and fashion have come hand-in-hand since the ‘90s, when artist began flexin’ their designer clothes and jewelry in music videos and lyrics. However, no rapper has ever reached fashion icon status and respect from the fashion world like G-Dragon has. A man liking clothes and shoes and accessories has been periodically accepted over the years, but a love and fascination for it is almost exclusive to women and gay men. This is where G-Dragon makes his mark. He’s a rapper, a producer, and a lyricist, and is respected as an artist in the entertainment business. The fact that his artistry translates over to his amazing range in his fashion styling does not detract from his musical talents or his “manhood.” With his fashion, the BIGBANG leader is a chameleon; he goes from avant garde to streetwear in a second and kills it every time. His style is always changing and evolving with time and trends, and he has never shied away from pushing gender boundaries with his fashion. A good example of this is last year’s Vogue Korea editorial, where he posed with model Soo Joo, both of them styled identically to look like twins. Androgyny is not a look that has been on the mainstream and widely accepted, it is mostly reserved for the arts. But G-Dragon, with his small built and extraordinary fashion, has been making a case for bending gender since his debut. Can anyone logically make a good argument against a man wearing a skirt? Well, G-Dragon can make a good one for it. NU’EST’s maknae personifies the group’s concept: being different and unique and not being afraid to show it. 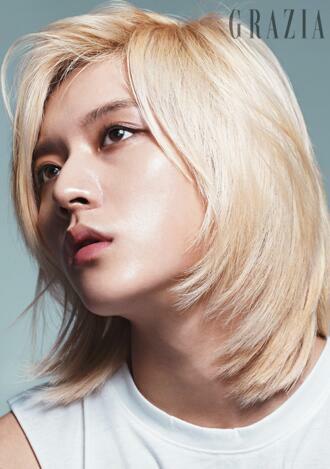 Ren contrasts his pretty boy image and charms with powerful performances. With this, he challenges society’s notions of masculinity and femininity by living somewhere in between them under his own terms; he even calls himself pretty. Just like androgyny, a man having feminine traits does not make him any less of a man. Ren promotes a healthy lifestyle that works well for him. And if anyone thinks that someone’s “manliness” is challenged by a guy listening to Lady Gaga or knowing all of the girl groups’ choreography and can deliver them spot on, is only unsure of their own identity. 2AM’s Jo Kwon has made a name for himself for various reasons, but most of it comes from his innate talent. The singer prides himself in having been a JYP Entertainment trainee for seven years before debuting and is a member of that agency’s ballad male group. Standing on stage wearing a suit and serenading the audience with his powerful vocals, Jo Kwon is a completely different person than what he showcases on TV: the male diva. Viewers witness Jo Kwon’s flamboyant personality when he fiercely dances girl group choreographies on variety shows or when he wore Jeffrey Campbell’s heel-less hoof shoes during his solo promotions. Furthermore, he recently took part in the Korean adaptation of the musical Priscilla, playing the dual roles of Adam and Felicia. Because of this, the singer gets called gay left and right. Everyone has an unsolicited opinion on his sexuality, but the reality lies in that Jo Kwon has repeatedly denied those allegations. That being said, the public must respect his stance. And, of course, the reality we live in is not that simple. The singer garnered lots of criticism and hate over his participation in Priscilla, leading him defend himself on Instagram, when he obviously didn’t need to do so. The fact that a straight man undertakes what society perceives as effeminate traits and behaviours and displays them for the mainstream audience shows how forward thinking some youth are. What Jo Kwon does is good entertainment and is well-received by the public; his sexuality is irrelevant. Even if he’s not gay himself, he’s paving the way for future queer celebrities to be accepted. Who’s your favorite male idol who defies gender roles? We’d love for you to share your picks with us, and don’t forget to follow us on Facebook, Twitter, Instagram, and Tumblr, so you can keep up with all our posts. Great article, well said!! I think none of these idols should explain themselves. I love them especially Jo Kwon (: Lol, he is rocking those heels and that fierce look! Never afraid to show the person he is, I’m proud of Ren. No matter the years he’s still the same person but has grow up so much in many ways. LOVEs are happy bcs he’s the person he wants to be. I love this, Korea is so modern when it comes to some of their idols that openly embrace their feminine sides, it’s beautiful. X) I love these idols that can be themselves without letting the public’s view of them affect how they live. Also, Jeonghan from SEVENTEEN embraces his feminine side pretty well, except he cut his hair. But, he still has that masculine-feminine face that he flaunts as both pretty and handsome at the same. I love these two!